My specialty in the kitchen would have to be Fried Chicken! Great giveaway! My specialty is probably stuffed bell peppers (easy and yummy)! My specialty in the kitchen is pasta carbonara! my specialty is making coffee- LOL. No I am good at making eggs! This is fab! I follow on GFC and Twitter, and my specialty is definitely my chocolate chip cookies... It's a gift, honestly. my specialties hmmmm... i'm gonna have to say 1. cookies, 2. banana & pumpkin bread, 3. PASTA! !, 4. broccoli. obviously i need to expand! ha! This looks like a fabulous book. I absolutely love cooking, and I'm always trying new recipes. Hello, my specialty in the kitchen is all things breakfast! From French toast to scrambled eggs and fresh squeezed OJ!!! I'm actually good at cooking a lot of things, but my specialty in the kitchen is definitely spaghetti. I'm also following you on GFC. This is a great contest. My specialty is Strawberry Shortcakes. In fact, I will be making them on Sunday if all goes planned. I want the brownie recipe. Cool give away. This is really a unique giveaway! 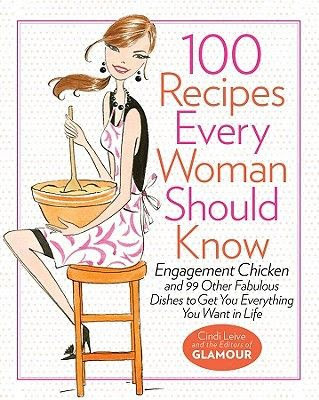 What a wonderful recipe book for every girl. i need this book! only the basics for me! i am a queen at toast....sad! Fabulous giveaway! My specialty in the kitchen would have to be pasta - it is so easy to make and you can add anything to it! I am the ultimate Idle Hostess - its one of the topics on my blog - and am extremely lazy. But I have mastered jamie's salmon with anchovies, olives and green beans. easy peasy. My kitchen specialty.... setting the oven on fire. I have done 5 times! Thankfully the fire department and sherriff are a few blocks away. And I must say I am now a pro with a fire extinguisher! You host the best giveaways! Good luck everybody! I have no specialty because I am TERRIBLE in the kitchen so this would be PERFECT for me! I hope I win! Holy crap I have been wanting this book FOREVER! Not kidding! I'm a huge Glamour reader and it has been on my must-buy list for ages. But I don't have money. Haha! Umm mac and cheese for me. But I make it from scratch so it totally counts I swear. My specialty in the kitchen is cookies! At least if they make it into the oven before I eat the dough. And also brownies, but I just make those out of the box. No skill involved for that. I tweeted about the giveaway (https://twitter.com/SCKDrizzle), but I just made a twitter account like 2 weeks ago, so it's not going to reach a large audience. And I'm already following you on blogger/twitter. I have this book checked out right now! Oh, gosh..tacos..would be my specialty. My new specialty is homemade pizza. Otherwise, I'm known for my cupcakes. I'd been wanting this book! My specialty is definitely my Symphony Bar brownies! And I follow you via Blogger, of course! My specialty is probably french toast. I am no cook, that's for sure. spaghetti sauce! it was the first thing my mom taught me to make! I make a killer eggplant parm. Yum! My speciality is dessert - especially cookies and cakes! Following you on twitter. My speciality is a peach cobbler..
My speciality in the kitchen would be cookies- I have one serious sweet tooth! I'm already a follower of this wonderful blog!